You'll be £14.99 closer to your next £10.00 credit when you purchase MESSERSCHMITT Bf 109. What's this? The most iconic German aircraft of the Second World War, the Messerschmitt Bf 109 was the Luftwaffe’s principal fighter from 1939 until 1942 when the superior Focke-Wulf Fw 190 came into greater prominence. The Bf 109 served in every theatre of the war, particularly in the invasion of France and the Low Countries, the Battle of Britain and the invasion of the Soviet Union, the Mediterranean and with Rommel in North Africa. In the later years of the war, the Bf 109 fought with success in the defence of Germany against the Allied bombers. The Bf 109 was the most produced fighter aircraft in history and more aerial kills were made with this fighter than any other aircraft. In this selection of unrivalled images collected over many years, and now part of Frontline's new War in the Air series, the operations of this famous aircraft in the early part of the Second World War are portrayed and brought to life. 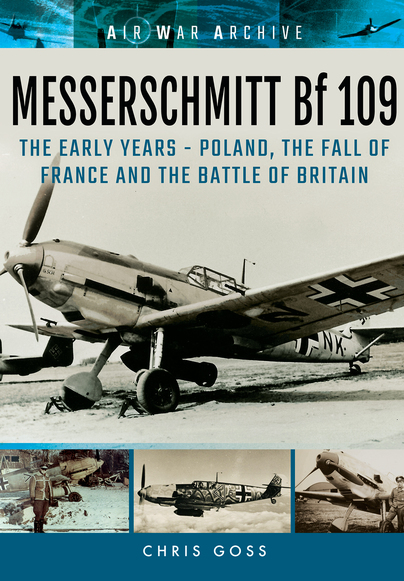 The book is well laid out, printed and produced, in the UK, and I can unreservedly recommend it to anyone with an interest in World War Two, the Luftwaffe in general, or the Bf 109 in particular... you will not be disappointed! The detail seen in many photos are a modellers delight, and you can get to see the gradual developments incorporated in the aircraft as time moved on. Captions are helpful and informative, and the various scenes, with airframes both intact, in flight, undergoing maintenance or in some cases, crashed following being shot down will be a boon to modellers as well as the aircraft historian who is interested in the story of the 109.